Since childhood his passion has been to weave together nature, spirit and the human being through prayer, sound and performance art. 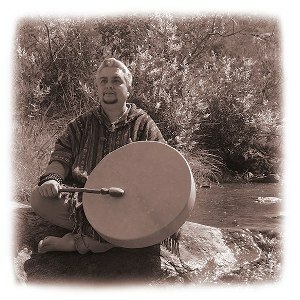 He has trained in Shamanic, Esoteric, Buddhist and Vedic spiritual traditions and considers himself very blessed to have been guided and supported by amazing teachers and mentors. He learnt to live his life by the natural laws of the universe and to see their living truth embedded in his lived experiences. Through his training and research with various spiritual traditions, he discovered the fundamental law of creation; the one is in the all and all is in the one. “We are holograms of the creator with the creator energy signature encoded within our DNA. So, in truth, we are co-creating our reality even if we may not realise it.” This realisation fuelled his awakening and changed the way he lived his life. Charles lives his life through and is informed by what he calls the Three Sacred Elements of Life; Sacred Service, Sacred Practice and Sacred Community. Sacred Service incorporates service to self, others, creation and Gaia. Sacred Practice is living life through responsibility, knowledge, wisdom, compassion and gratitude and includes daily ceremonies and prayers. Sacred Community means to share our lives with people who live in accordance with the natural laws of the universe, people who enrich us and are enriched by us. Sacred Community also includes our relationship to Gaia, the universe and all other life forms. His service to community is offered through a variety of pathways; sound healing; medicine wheel work and shamanic practices; spiritual mentoring and guidance; healing, manifesting and prayer circles; spiritual nutrition and however else he is guided to serve. We are eternally grateful to have Charles Snelleksz-Mathelot as part of our Sound Team at The Sound Temple in the Perth Hills.